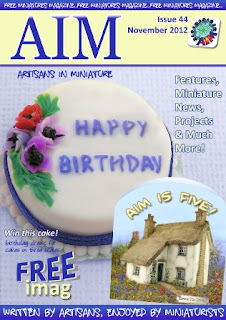 Join us as we share our 44th issue of the AIM imag! This month our celebratory 'Birthday' issue of the AIM imag is yet again packed with a wide variety of miniature fun, articles, news and projects for you ALL to enjoy - and as ever all downloadable for FREE! So grab yourself a cup of something nice and settle down for a great read! Congratulations and thank you so much for all the effort and generosity in this free imag. I am always excited when new edition comes out and can honestly say that this is better than the magazines you have to pay for! Thank you again. à chaque nouvelle parution, ce n'est que du bonheur à lire et relire votre magazine. Merci à tous les créateurs pour le partage. Vivement le prochain N° !